I Will Teach You The Same Guitar Theory That The Pro's Use To Take Your Guitar Playing To The Next Level... And Beyond! Hi, my name is Jonathan Boettcher, and over the last few years I've helped literally thousands of guitar players finally understand their guitars, using just a few rarely-taught concepts that most guitar teachers avoid like the plague. When I was six years old - remember the good old days when life was carefree - my parents put me in piano lessons. My teacher was an old woman who lived across the street and down a block. I went to visit her once a week to learn how to play. Can't I Just Learn The Chords? Most beginner guitar players start out by learning a few chords and some simple songs. That's cool - its a good start. But as I've helped other people learn the guitar, I've observed that there's a general lack of understanding as to exactly why we play what we do. More importantly, I've noticed this lack of understanding really slows down progress, and even worse - can make learning the guitar confusingand feel like a lot of hard work! There's this concept in music called I - IV - V. If that looks like Greek to you, it's not - it's Latin! I-IV-V (that's 1 - 4 - 5 in English) refers to the root note (I), or tonic, and the two notes in perfect relation to it (IV and V). Because it is a numbering system, it is universal, and applies to every single key. Simply put - this lesson on I-IV-V will show you how the guitar fretboard is built on patterns of I-IV-V, and once you see the patterns, your guitar will come alive in a whole new way. More confidently, because now you'll know WHY! Ok, good, so you know it takes a while to get your bearings and to find your way, right? Now - have you ever had a friend visit your home town, and showed them where to go on a map? Chances are that map just intuitively made sense to you, because it described familiar landmarks, right? Understanding I-IV-V as it relates to your guitar will be the key that unlocks your guitar in your hands - unleashing your true potential as a player. I promise (more on that later). When I was a teenager, I started taking guitar lessons. My guitar teacher approached music from a totally different angle than I'd ever seen before. Suddenly theory not only made sense, but it came alive in my hands! Now I don’t play a note without knowing why (for the most part!). Rockstar or campfire jammer – and everyone in between – you simply have to understand I-IV-V.
80% of musicians don’t understand I-IV-V properly, yet it is so important that the Pro’s communicate onstage in these terms. 95% of popular songs (in every genre!) are built on this formula, or variations of it. Ok, so I don't know if the numbers are bang on or not - but from personal experience I would say they are. And it is 100% true that the Pro's communicate using the number system. So What Happened To The Piano Lady? Remember I started telling you about my episode with the piano lady? Well, I ended up quitting after three months. My parents weren't sure if I would ever like music again after that (good thing they were wrong!). The thing is... I DON"T WANT THIS TO HAPPEN TO YOU! But none of them (so far as I've seen - and I've seen most of them by now) presents I-IV-V from the same perspective that you'll be seeing it here. Learn why chord numbers are far more important than chord letters. Instantly figure out all the relevant chords in any given key. Understand intuitively how guitar scales are created and formed. Figure out and play along with nearly any song in a couple minutes. Learn how to build your own chords; never rely on clumsy chord charts again! It is not a complete 'learn to play guitar' course. It is a single 109 minute video lesson. It does not teach how to play chords. It does not teach you how to strum. Unlocking I-IV-V is none of these things. But it will perfectly complement any course that does teach these things. If you were to hire a guitar teacher to sit down with you for 2 hours, and explain I-IV-V to you, it would cost you at minimum $120. Then you'd leave, and if you had questions later on or forgot something, you'd have to come back and pay again. With the Unlocking I-IV-V DVD you can hit rewind and re-watch any part that you don't pick up immediately. As they say, video is the most patient teacher in the world! "So much revelation about chord structure"
Cool lesson, very down to earth. Speaking as an elementary teacher, you kept it simple and to the point. Your DVD gave me so much revelation about chord structure that I sat down and started fooling around with some chords. I also started helping out my buddy at his guitar school so this will come in handy big time. The added weekly tips, I think, will be extremely helpful. I think this old dog is gonna learn and understand some new tricks! Plus, I'll Throw In Three Great Bonuses! CHEAT SHEET: The entire guitar fretboard with every note in beautiful detail. Print this out and keep it in your guitar case. $5 Value. Print these cheat sheets (they're in color) and keep them handy in your guitar case! Does Your Guitar Still Seem Confusing? I've explained I-IV-V to quite a few guitar players, and for many, it is like putting the final piece in a huge jigsaw puzzle: finally you get to see the whole picture, and you get it. The final gear drops in place, and you're off to the races. Have you tried to learn music, but been intimidated by having to learn each key? Would you like a rule of thumb so you don’t have to memorize anything?. Discover why all keys follow the same patterns, just with different letter names. "This will take my guitar playing to the next level"
I had a chance to review your lesson on the 1,4,5 theory and it was exactly what I was looking for. It was very informative and easy to follow. I honestly believe that this will take my guitar playing to the next level and then some... the more that I watched the more that it made sense. Very well done and I would have to say that I would not change a thing. Thanks for this lesson and I look forward to future lessons! Is Your Guitar Goal On This List? Unlocking I IV V will help you accomplish all these goals, by giving you a solid foundation and understanding that will make progress come quicker in all areas of your guitar playing. Honestly, I've met better guitar players than myself who didn't understand the material I'll be revealing to you. Any guesses as to what happened when they learned? Yup - their playing improved faster than a speeding bullet, to borrow a phrase from Superman. You can be a great guitar player, and yet know very little about how the guitar works. It seems strange, and yet I've seen it happen over and over again. However, as soon as those players get an understanding of what's going on with their fretboards, they automatically improve further. Q: Do I need to be a good player already to use this? A: No! Unlocking I-IV-V is equally relevant for players of all levels. Q: Is this a complete 'learn to play guitar' course? A: No! 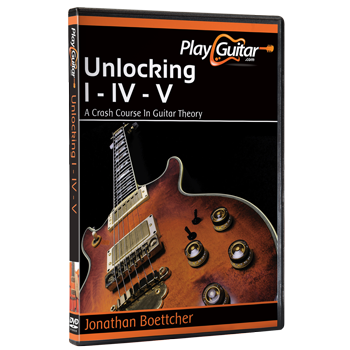 Unlocking I-IV-V is an intensive 109 minute video that will give you a crash course on guitar theory. This course would be the perfect companion for a more complete guitar program, as it offers a unique perspective I've not found in any of the products I've reviewed. Are You Ready to TRULY Unlock Your Guitar? Learn to create your own chords, anywhere on the neck. Are you ready to finally discover the secret to how music works, and how to apply it to your guitar? To watch that seed grow and spread throughout every aspect of your guitar playing, affecting and improving every note you play? Let's work together to take your guitar playing to new heights! PS. The I-IV-V lesson will greatly improve your knowledge of the guitar and your ability to play it, and it will also help you better understand many of the other guitar courses out there. PS. Your order includes the main lesson, as well as all the bonus material, including the cheat sheets and additional video content. Hi Jonathan... Well, I've had a chance to look at the video... many times; and I still look at it several times throughout the day. You have a way of making your lessons understandable unlike any "help" that I've ever received. Like you said, there is a lot of information packed into your lessons. One thing I've noticed already is that I was able to apply the number system to assist in learning a song that I needed to know for yesterday. I saw the pattern (I-V-VI-IV) and learned the song in a matter of a few minutes. It usually takes me hours of listening... stopping the music to find the notes... slowing the tune down with Transcribe... very time consuming.